A short series of wide field views of the Milky Way, taken at the Macarthur Astronomical Society dark sky observing site at The Oaks. 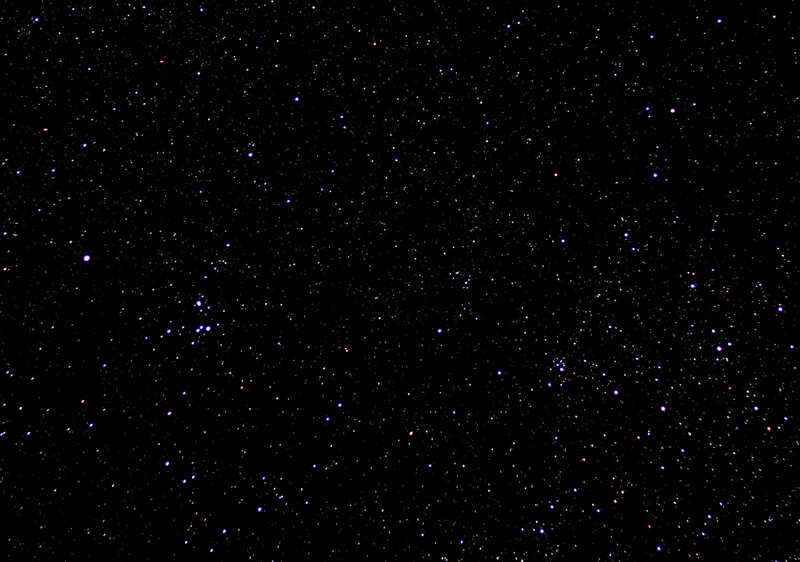 Above: A Pair of adjacent Open Star Clusters. IC 2391, the Omicron Velorum Cluster (left) is about 50 arc-minutes in diameter and 580 light years distant. IC 2395 (right), is about 18 arc minutes in diameter and 2609 light years away. The bright mag 2 star on the left is Delta Velorum – actually a close double binary star system – and the brightest star in the sky without a name. In about 9000 years, this star will become the South Pole Star! 2017-05-25: the Eta Carina Nebula (NGC 3372), Theta Carina Nebula (IC 2602), an open star cluster (NGC 3114) and plenty more in this wide field view of the Milky Way. 2017-05-25: the Carina Region of the Milky Way ; also showing the Large Magellanic Cloud (lower left). 2017-05-25: A Pair of adjacent Open Star Clusters. IC 2391, the Omicron Velorum Cluster (left) is about 50 arc-minutes in diameter and 580 light years distant. IC 2395 (right), is about 18 arc minutes in diameter and 2609 light years away. The bright mag 2 star on the left is Delta Velorum – actually a close double binary star system – and the brightest star in the sky without a name. In about 9000 years, this star will become the South Pole Star! Yes, Kazia, the Earth’s poles are “wobbling” like a spinning top, over a cycle of 26,000 years. I should have mentioned a bit more about that, axial precession is an interesting topic. It is very interesting. The gravity shapes dynamic motion of our cosmic environment! Thank you for your inspiring captures and hints. There are lots of wonderful information on Net for me to get familiar with astronomical terminology. Roger, I’ve just downloaded Star Walk2+Star Atlas and Night Sky View on my Ipad. I think I must have been a bad influence on you, Kazia! Yes, plenty of information sources and apps available. I cannot go out to an observing night in the field without my i-pad now, it is invaluable and accurate. 🙂 Good evening to you, Roger. I meant to say I welcome your sense of humour. Roger, you do not wish to follow my Flicker photographs? Oh, I see. Take your time, Roger.